Garmin continues to redefine the leading edge of vehicle GPS systems, and with the 800 series they’ve succeeded again with a truly hands-off GPS that accepts your voice commands, and does so accurately and intuitively. CNN/Money describes it as “…the most advanced speech recognition system on a personal navigation device to date.” According to U.S. News & World Report, “you won’t be disappointed with the Garmin nuvi 880.” Not only has Garmin set the bar higher with the 880, but once again, redefines the vehicle GPS as we’ve known it. Building on the the overwhelming success of its nuvi line, which both dominate U.S. sales and consistently garner the highest owner satisfaction ratings, the nuvi 880 brings the strong nuvi heritage forward with a breakthrough in voice-recognition technology. We were excited when vehicle GPS systems first introduced text-to-speech technology which reads street names aloud. It meant you didn’t need to read the street name from your GPS screen, allowing you to keep eyes forward on the road, an important safety enhancement. With voice control, Garmin allows you to keep eyes forward and hands on the wheel while navigating on the road, in our judgment an even more significant safety enhancement. The 800 models include receivers for both FM-TMC traffic and MSN Direct services, giving you a choice of services for real-time traffic monitoring. A 3-month subscription to MSN Direct, which provides traffic and weather updates, fuel prices, movie listings, local events info, and more. If saving money on gas is important to you, the MSN service provides both the ability to avoid traffic and find the least expensive fuel. 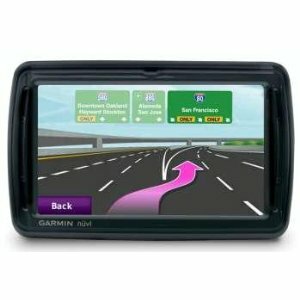 Garmin has rolled out some other nice features with the 800 series, such as the ability to send addresses to your GPS directly from Google Maps or Mapquest. Simply find a restaurant or other location you want to visit on Google Maps or Mapquest and specify “send to GPS” and the location will automatically transfer to your GPS when connected to your computer. The 800 series inherits the popular wide-screen design of the 600 and 700 series, but in a sleeker case. The 800 series includes text-to-speech capability which reads street names aloud, keeping your eyes on the road, not on the GPS. The 800 series also includes an integrated FM transmitter to send its voice-guided directions, audiobook or MP3 audio, or your telephone conversation via Bluetooth connection (not included on the 850) to your car’s stereo system speakers. The nuvi 800 series includes Garmin’s “Where Am I?” safety feature which helps you find the closest hospitals, police stations, fuel stations, nearest address and intersection. It also lets you see your exact latitude and longitude coordinates. Also included is the “Last Position” feature, which, among other things, can help you locate your car in a large parking lot. Received my GPS as a 2008 Christmas gift. I’ve truly enjoyed my latest gadget. Wonderful, dependable and easy to use. Reliable–Very pleased!